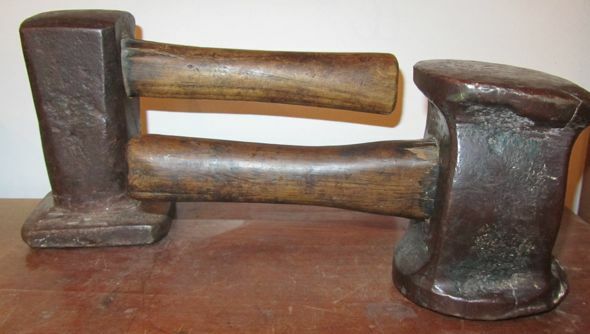 A private collector has stepped out of the shadows and agreed to let me post some images of his beating hammers. I hope a few more have the temerity to do so. While this may raise the prices of hammers that come on to the market (and in your collection), isn’t it better to at least to circulate information about your collection? And isn’t part of the fun of collecting showing off your collection, even if anonmously? 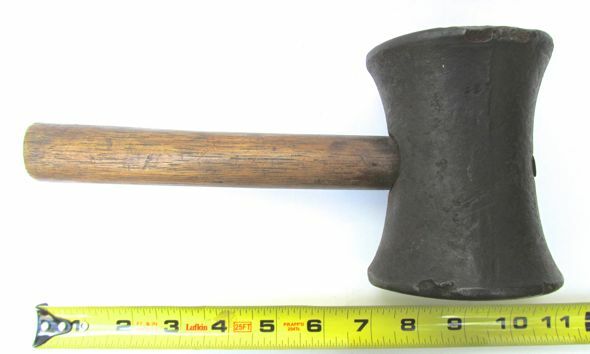 This hammer looks very much like the early 18th century German beating Hammer as pictured in ZIedler and has almost exactly the same weight, 7 1/2 pounds. The illustration in Ziedler is a very crude woodcut, almost like a line drawing, but it clearly shows this essential hourglass shape. But all the other hammers I have seen with this shape are goldbeaters hammers. Possibly used for both trades? 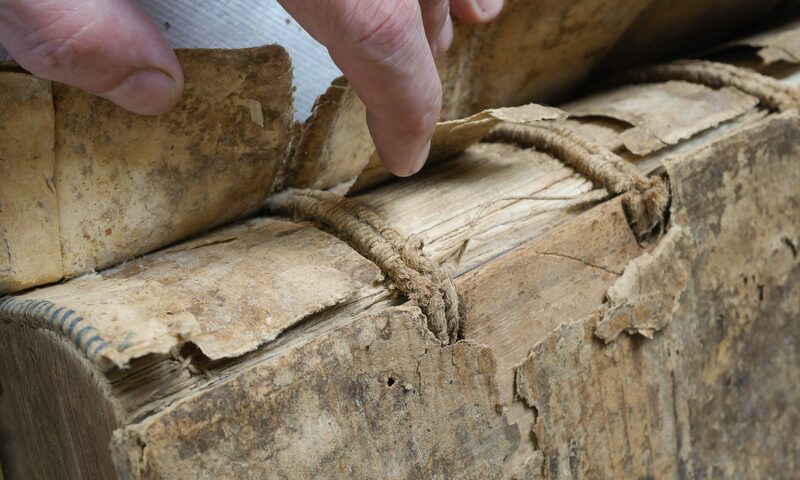 If it is a bookbinder’s beating hammer, it is one of the earliest ones I have seen. The curved sides also seem to have been used for other purposes, judging from the dings. The handle is a replacement. In any event very intriguing hammer. This one looks like a 19th c. English beating hammer, but there are many stylistic differences, so I think it is a very crude custom made version for a binder. Of course, custom made tools for a binder are not without interest. The handle is a replacement and apparently carved down to fit. There are some large casting depressions opposite the face. 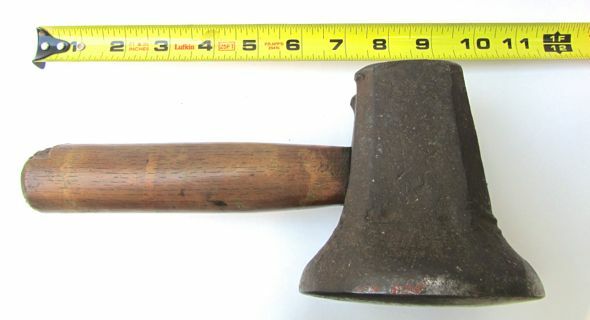 It also has a very sharp rim and uneven belly.It just doesn’t look right, or have any of the stylistic consistency that other English hammers I have seen have, though it does fit nicely with early nineteenth century textual descriptions which generally refer to a “bell” shape. Basel Paper Mill: The Swiss Museum for Paper, Writing and Printing. The hammer in back is unlike any one I have ever seen. The lip is so thin and there is no evidence in historic images of an offest handle shape like this. Almost all beating hammers I’ve seen are chipped around the lip. Is this an altered filemakers hammer? Who knows. The one in the front is the most beautiful bookbinding beating hammer I have ever seen. It is great the museum hasn’t overly cleaned the handles or the head: much of the information about how these hammers were held and used must be derived from the dirt, wear and stains. It has a nicely shaped, older handle. The head appears to have been smashed in a decisive moment, as if it were molten and suddenly frozen upon impact, but with an impact which took place over decades, if not centuries.